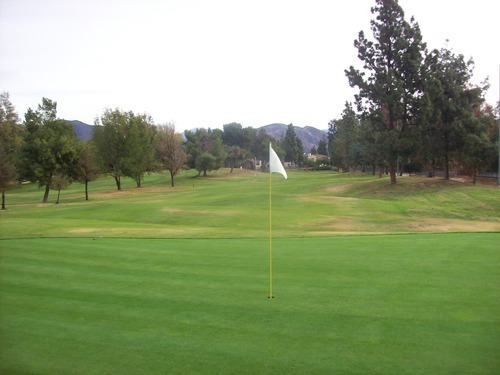 I booked a 7:30 tee time as a “hot deal” through GolfNow. It was only $4 and included a bucket of range balls! In all my years (comp rounds not included), this is officially the least I’ve ever paid for a round of golf. I got there around 7:00 and it was not busy at all, so I teed it up right away. I did catch up to another twosome who didn’t seem to want to let me play through, so I just hung back. It was still a good pace of less than an hour, so there was no need to push much. This many Short Course Blitzes in, it’s getting harder and harder to describe and distinguish between some of these smaller and often more basic courses. Pico Rivera kind of blends into the pack. 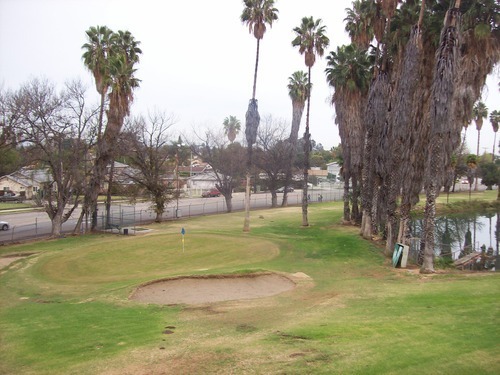 It’s an okay little course along the San Gabriel River, but nothing too exciting. 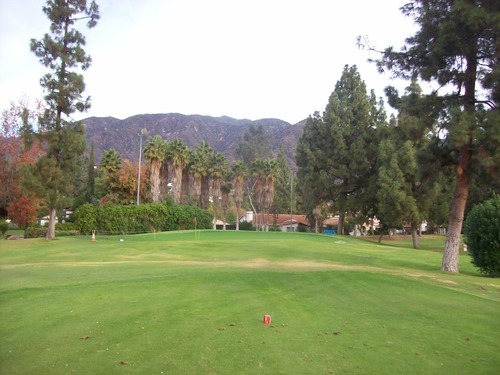 There are two short par-4s in the layout and otherwise par-3 holes of varying lengths. 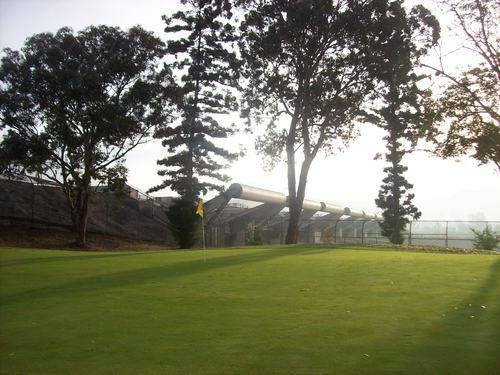 It’s a 9-hole course, but it does have separate tees for front and back nine play. 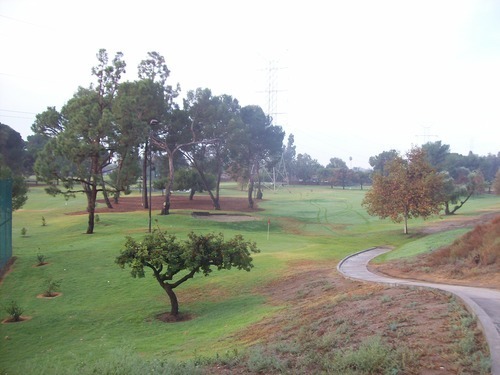 In every case, the back nine tees are further up. 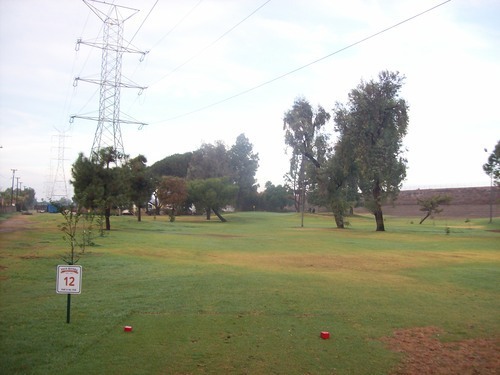 Each set of tees also includes a choice of a mat to hit from or a grass section a few yards ahead. I use the term “grass” very loosely, though, because they were extremely chewed up. The greens were in decent shape—soft and a little slow—and the main fairway landing sections on the two par-4s were decent enough, so no complaints about the conditions (especially for a $4 round). Rancho Duarte is basically just past the end of the 605 Freeway after it runs into the 210. I got up there and saw the course was not crowded at all. I still had a pretty narrow window of time and needed to get around quickly, but I went for it. The price was only $10 for nine holes, and I shelled out an extra $15 to get a cart. 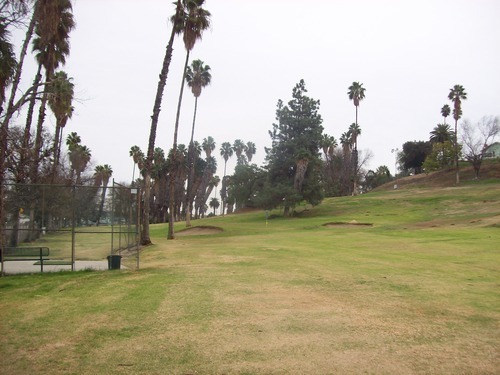 I played through one twosome early and otherwise was able to sprint around the course as quickly as I needed to. 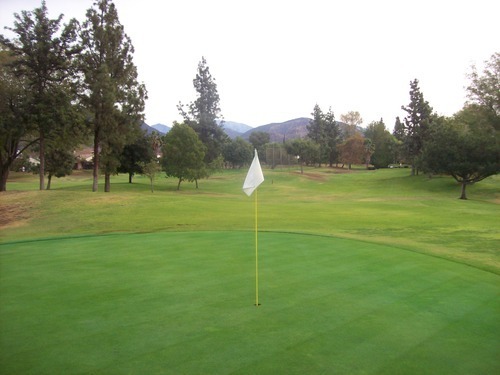 Rancho Duarte is a par-31 layout with four short par-4 holes and a variety of par-3s. 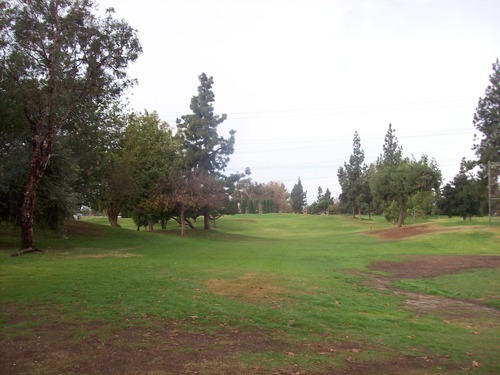 It was playing extra short when I was there because they had the back sets of tees closed for maintenance and every hole was playing up at the red tees. It’s a short layout either way, but this really made it easy. Probably the biggest appeal of this course is the setting. It is up against the foothills, so you get some nice views. When I was there it was quite overcast, so that kind of sucked, but I could still tell the scenery is generally one of the nicer aspects of this course. Other than the back tee boxes being closed, the course was in decent shape. 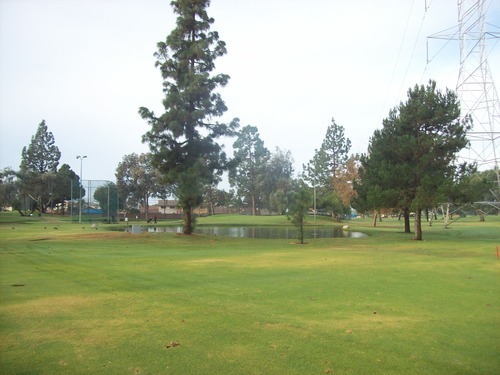 There were lots of muddy/soft spots after the rain, but it was playable enough. What mattered most was the greens and those were in nice condition. 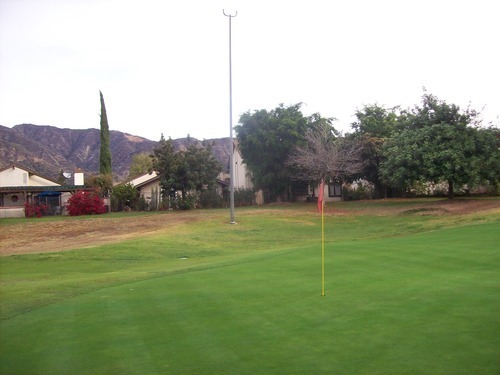 The greens at Rancho Duarte feature some pretty tricky undulation and a few really severe slopes. The greens were running pretty fast and that was easily the biggest challenge factor during my round. 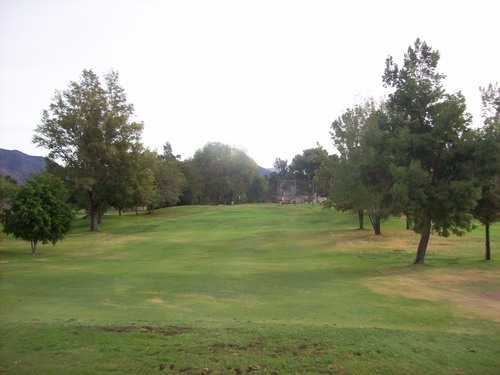 Like the rest, Rancho Duarte is a fine little track that serves its purpose just fine as a beginner’s course or just a place for a casual practice round. 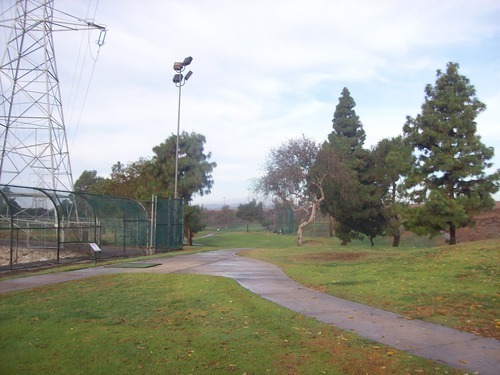 This is a course most people don’t even know exists and probably for good reason, but it’s right there near where the 71 and 60 freeways meet. It may have been closed down at one point because there’s a sign out front that says “Now Open” and that made me wonder. 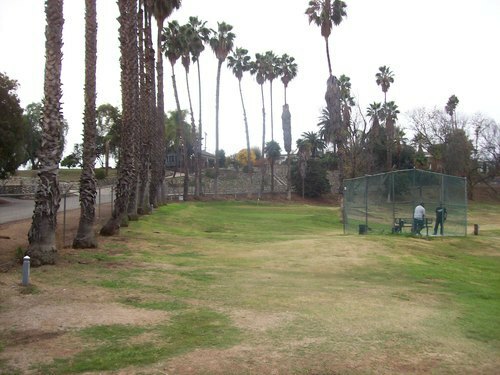 Again, it was not busy when I arrived, so I was able to tee it up (rather hit off the mat) right away. The guy working there was super nice and even offered to let me loop around at least once more after I finished. That was a kind gesture, but I was fine with just nine holes. The price was $7. I did play through a few people along the way, but was able to finish very quickly. 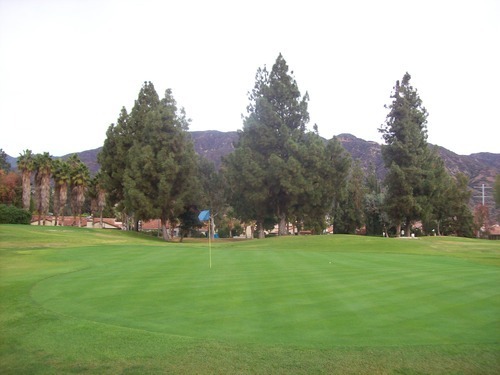 Palm Lake is a very simple little par-3 course. As I mentioned all the tees are just mats. The greens are pretty run down and so is everything around the course. 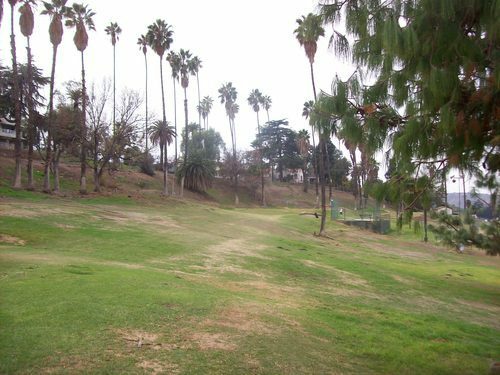 It plays along a little hillside, so that keeps it from being a super flat and boring par-3 course. 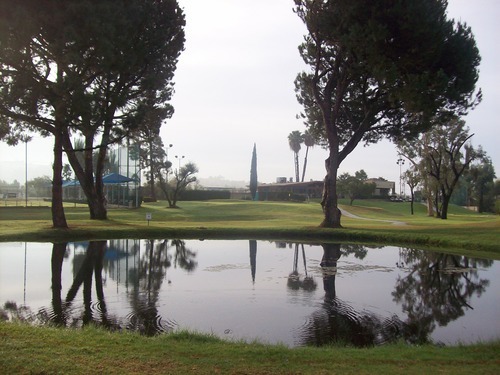 There is a swampy little pond in the middle of the course with a bunch of palm trees around it, so I assume that is the “Palm Lake” that gives the course its name. The locals I ran into seemed to be having a good time here and that’s what matters. Serious golfers won’t find much enjoyment here. For me it was just another one to check off the list, so I tried to enjoy it as much as I could. These Short Course Blitzes require a certain mindset. 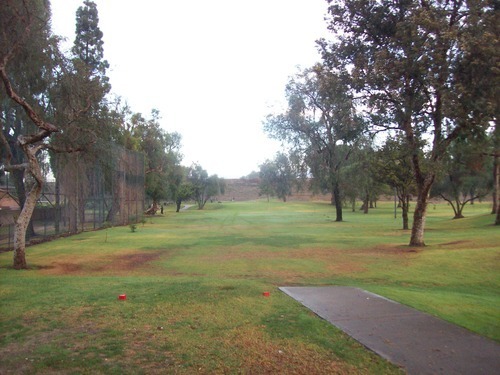 With such a fantastic course (Hacienda) in the midst of the courses I played this day, as well as some gloomy weather, that probably put a damper on this particular blitz. Oh well, I shall forge ahead until I’ve collected them all, Pokemon style!